Six fundamental factors that the Maharishi Jyotish Pandits take into account when making their predictions. 1 Planets: The 9 Grahas Include the Sun, Moon, Mercury, Venus, Mars, Saturn, Jupiter, plus the two lunar nodes known as Rahu and Ketu. Seen from the earth, the Planets or 9 Grahas move continuously through the Signs of the Zodiac or 12 Rashis in your Birth Chart, constantly changing their influences on specific areas of your life, such as health, education, and business. In addition to the Sun, Moon and Planets, the 9 Grahas include two lunar nodes—Rahu and Ketu. Rahu is the point where the Moon crosses the Sun’s path moving upward toward the north, and is called the Ascending Lunar Node. Ketu is the point where the Moon crosses the Sun’s path moving downward toward the south, and is called the Descending Lunar Node. 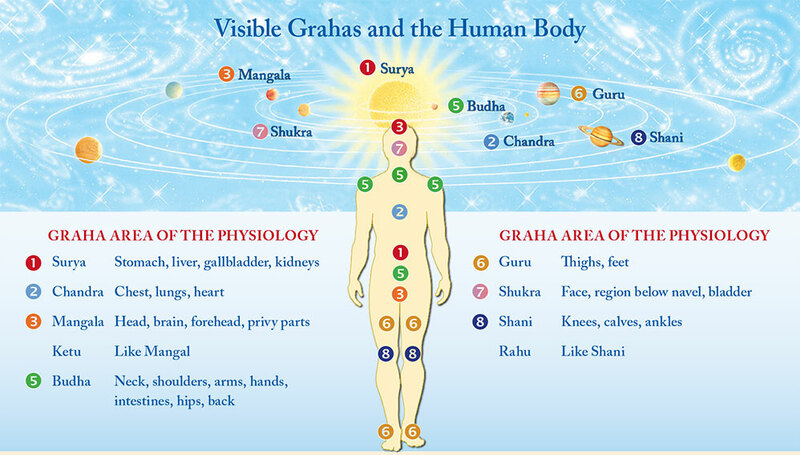 The chart below identifies some of the qualities represented by each of the Planets or 9 Grahas and their counterparts in the brain physiology. At its basis, all of creation is unified. This is the foundation for the discovery by Professor Tony Nader (MD, PhD, MARR) that there is a clear correlation between the solar system and the human body. Dr. Nader found that the attributes of the Planets and stars, along with their relationships to the Cycles of Time or Dashas, are mirrored precisely by the structure and function of our brain physiology, cells, and DNA, all of which give rise to our experience of life. This illustration shows the relationship between the internal structures of the brain and the Planets or 9 Grahas. In the solar system, all activity revolves around the Sun. In our brain, all activity is controlled and ordered by the thalamus, located in the center of the brain. Just as the Sun corresponds to the thalamus, each of the 9 Grahas relates to one of the important structures of the brain. There is also a one-to-one relationship between the internal structures of the cell and the Planets or 9 Grahas. In Maharishi Jyotish, the Sun represents the king, who serves as the leader and organizer of the kingdom. In the cell, the nucleus serves as the information processing center and administrative guide. Therefore on the molecular level, the Sun corresponds to the nucleus, located in the center of each cell. Understanding these connections between the cosmic intelligence of Nature and our own human intelligence can give us insight into how we can best take advantage of opportunities in our own life. We can help avert problems, improve society, and create balance and harmony in the world by harnessing the limitless power of Nature. The Maharishi Jyotish and Maharishi Yagya programs are powerful tools to improve all aspects of both individual and collective life. 2 Signs of the Zodiac: The 12 Rashis The astrological signs are represented by 12 equal segments of a circle, with each Sign of the Zodiac covering 30 degrees. The Signs of the Zodiac or 12 Rashis are constellations used in astrological predictions. Each Planet or Graha moves through the Signs of the Zodiac at a different speed. For example, the Sun passes through each Rashi in one month, and the entire circle of 12 Rashis in the course of one year. This is why the Signs of the Zodiac are referred to as Solar Constellations. Each Sign of the Zodiac or Rashi has specific characteristics which reflect the potential of your personality, physiology, and behavior. As a Planet or Graha travels through the Signs of the Zodiac or 12 Rashis, its qualities and strengths are influenced by its relationship with each Rashi. These changing influences can be positive or negative, and are considered carefully by the Jyotish Pandits before making their predictions. According to the Maharishi Jyotish program, our entire universe can be understood as having the form of a cosmic body that mirrors our human body. Traditionally, each Sign of the Zodiac is connected to a specific part of the body, and the 12 Rashis play a major role in identifying the current and future state of your health. 3 Lunar Constellations: The 27 Nakshatras Signify a specific quality of Natural Law that influences your life, and are represented as 27 equal segments of a circle. The Lunar Constellations or 27 Nakshatras have an influence on the Planets or 9 Grahas, and also influence the Signs of the Zodiac or 12 Rashis. 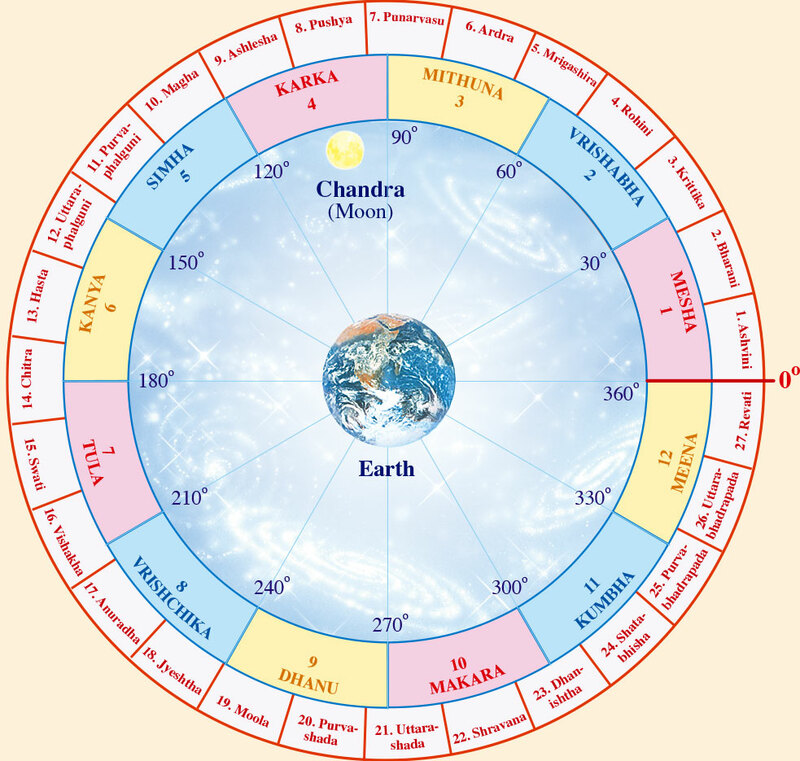 The Moon moves through the full circle of 27 Nakshatras in about 27 days, passing through one Nakshatra each day. This is why the Nakshatras are called Lunar Constellations. Like the Planets or 9 Grahas, each Nakshatra represents a specific quality that influences your life. The word “Nakshatra” can be translated as “that which does not decay.” Nakshatras are understood to permeate the entire universe. In this chart, we see the relationship of the Moon to the Signs of the Zodiac or 12 Rashis (inner circle) and to the Lunar Constellations or 27 Nakshatras (outer circle). 4 Birth Chart: Kundali Graphically presents the location and relationships of the Planets, Signs of the Zodiac, and Lunar Constellations at the moment you were born. The Birth Chart is calculated from the time and place of your birth, and serves as a snapshot of the universe at the moment you were born. 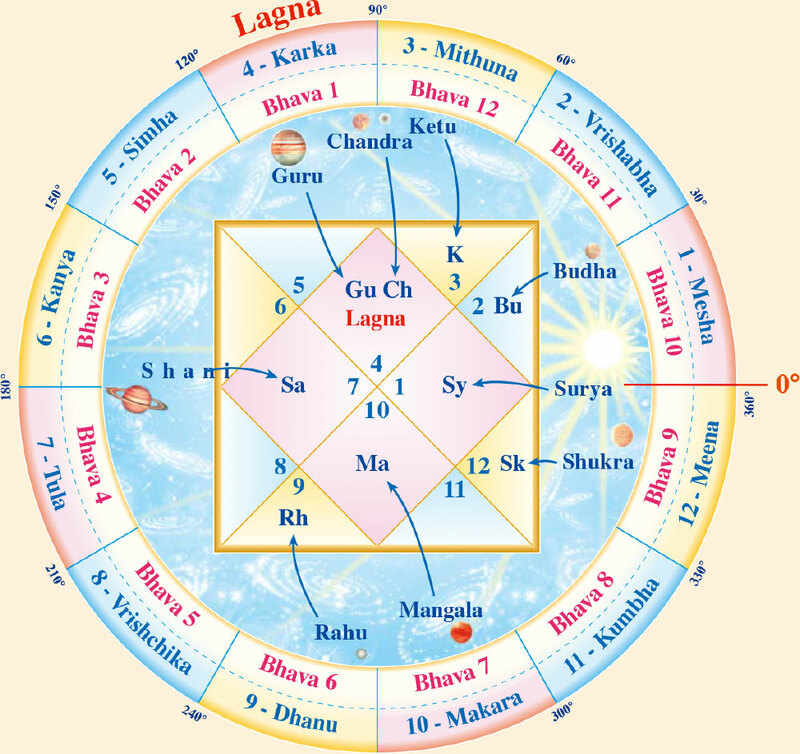 Each of the 12 Houses or Bhavas in the Birth Chart is associated with a specific area of life. The position of the Planets or 9 Grahas, the Signs of the Zodiac or 12 Rashis, and the Lunar Constellations or 27 Nakshatras, along with their relationships, reveal the interconnection between the universe and your own individual life. By analyzing the placement of all these elements in your Birth Chart, the Jyotish Pandits can foresee what influences are coming to you, and when they may arrive. They can also predict which areas of your life these influences will affect, including health, happiness, relationships, prosperity, education, career, and marriage. The Comprehensive Birth Chart portfolio is a special feature of the Maharishi Jyotish system of analysis. It allows the Jyotish Pandits to consider the impact of your closest living family members—parents, spouse, and children—upon your personal destiny. The Maharishi Jyotish Consultation is based on a detailed analysis of your Birth Chart, and provides practical knowledge to manage your life with greater confidence. 5 Cycles of Time: Dashas Periods governed by the Planets or 9 Grahas, which describe how the trends of your life will unfold sequentially over time. At every moment, there is a combination of Planets or Grahas that have a predominant or ruling influence in your life for a specific period of time. These are called Cycles of Time or Dashas. 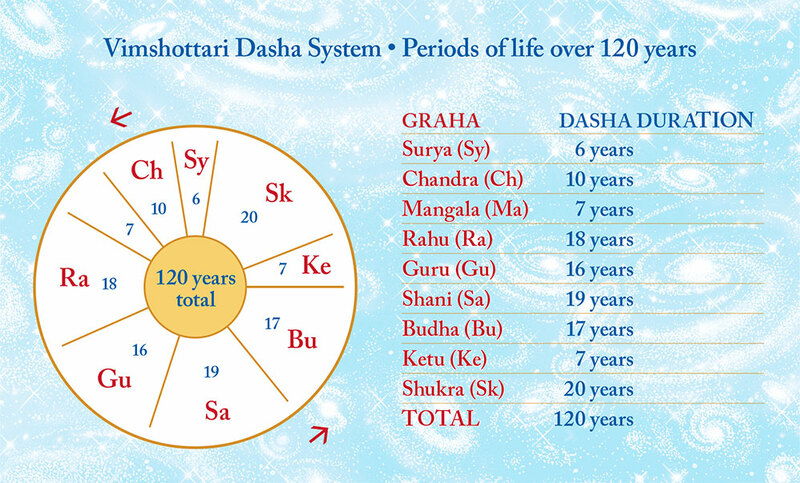 Each person begins their life at a specific point in the sequence of the Dashas, based on the position of the moon at the moment of their birth. This chart shows the sequence of the major Dasha periods or Mahadasha. On the left side of the chart is the length of the Mahadasha in years listed for each of the Planets or 9 Grahas. The right side identifies the ruling Graha, beginning with the Sun or Surya and ending with Venus or Shukra, together with the duration of each Dasha over a 120-year period. 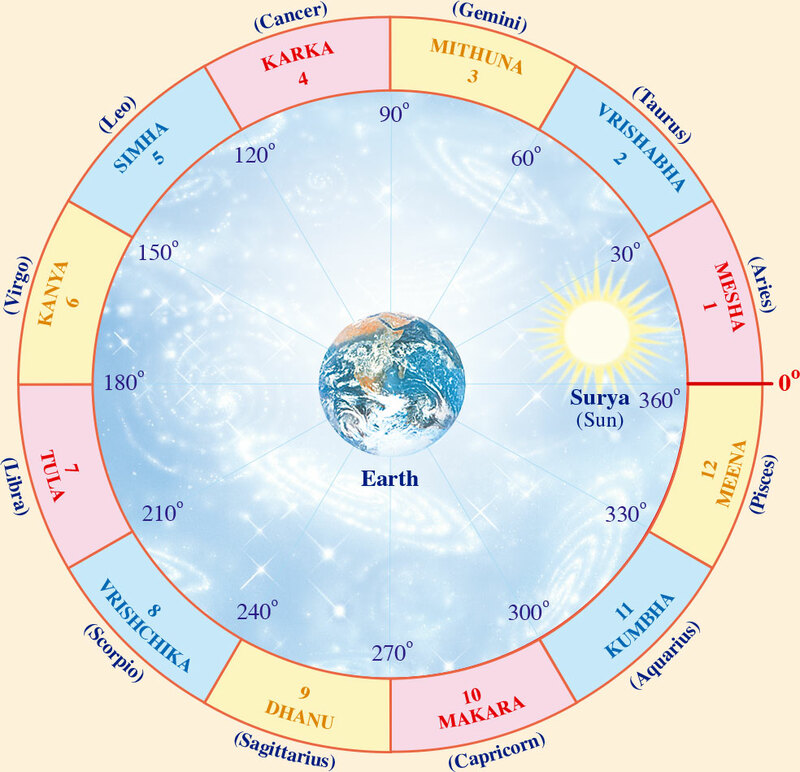 Within the span of each Mahadasha period there are sub-periods called Antardashas that follow the same sequence of Planets. Likewise, within each Antardasha there are sub-periods called Pratyandtardashas. 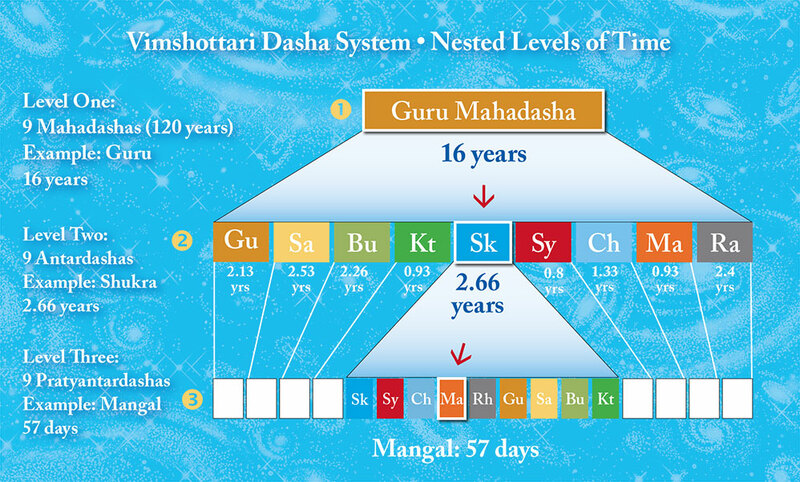 The Maharishi Jyotish Pandit will calculate the date when each new Dasha period and sub-dasha period begins in your life. They will also provide the duration of the rulership or major influence of each Planet or Graha in years, months, and days. During a Maharishi Jyotish Consultation, the Jyotish Pandit will predict future trends based on the starting and ending date of your Dasha periods. They will also identify events or specific qualities of life that may arise in each period, including both opportunities and areas of concern. 6 Planetary Transits: Gochar Reveal the changing positions of the Planets or 9 Grahas as they move through the Signs of the Zodiac and Lunar Constellations. Planetary Transits or Gochar indicate which Planets or Grahas currently have the strongest influence on your daily activity, and in which areas of your life they manifest. When transits of the Planets or Grahas are considered in relation to the Cycles of Time or Dashas, the Jyotish Pandits are able to make the most specific and concrete predictions. This is why Planetary Transits and the Cycles of Time are always considered together. 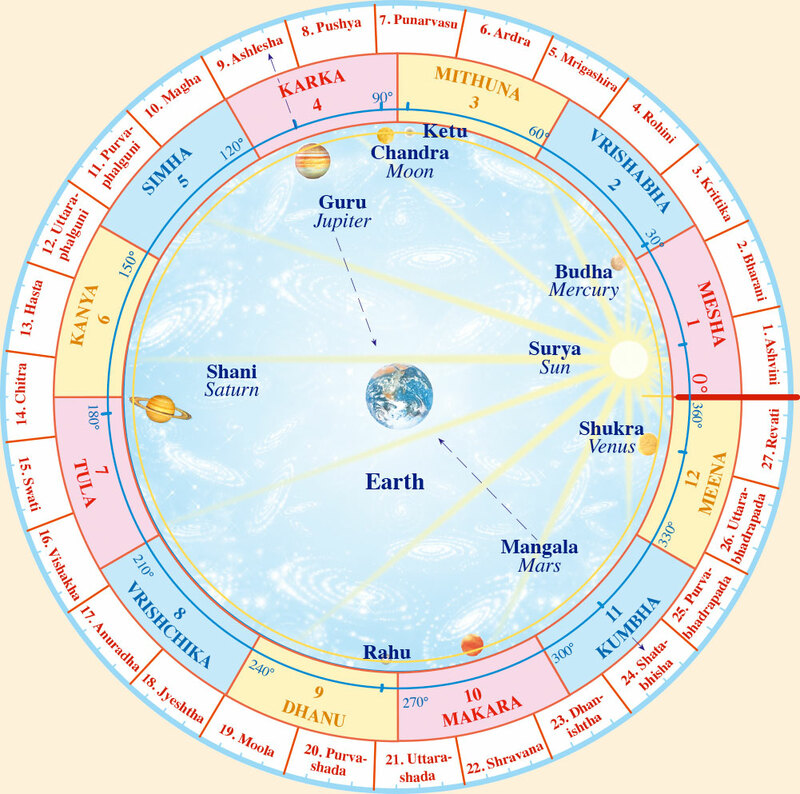 In this chart we see all of the Planets or Grahas moving at their own speed through the Signs of the Zodiac or 12 Rashis, and through the Lunar Constellations or 27 Nakshatras. There is a constant flow of changing relationships between the Planets, Signs of the Zodiac, and Lunar Constellations. These changing relationships create predicable trends in all areas of your life, which are sequentially laid out for you during your yearly Maharishi Jyotish Consultation.